More room for error is a touring exhibition of new works by artist Nicola Ellis examining the physical join between objects and the space they inhabit. Commissioned and curated by Mark Devereux Projects, the project launches at ArcadeCardiff (Cardiff), before moving on to &Model (Leeds) and Bloc Projects (Sheffield) in August/September. 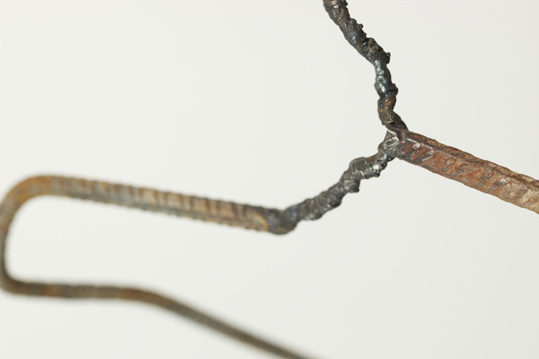 Much of the works within the exhibitions are focused around Ellis’ investigations into metalworking, with a particular focus on welding steel. Ellis has studied, researched and learnt the industry standard rules, which she has then gone on to question, dissect and divert into a methodology for creating art works. The results of this investigation, mixed with acts of ‘play’ and interpretations of space, offer an opportunity for us to consider the relations between what is sculpture and what is structure. Featuring work made over the last eighteen months, alongside pieces made in situ, More room for error is the largest exhibition of Ellis’ practice to date. Ellis will be in residence at Arcadecardiff prior to the launch of the exhibition creating new work in response to the fabric of the space. Complementing the exhibition, Mark Devereux Projects have commissioned a new publication featuring an essay by &Model Director Derek Horton and works made during the project. More room for error is funded by Arts Council England and has been developed, supported and commissioned by Mark Devereux Projects, with thanks for support from Eltec Engineering Services, Littoral, Arcadecardiff, &Model and Bloc Projects. Nicola Ellis is Supported by Mark Devereux Projects. SUNDAY 24 MAY, 11AM – 6PM: Artcarbootique at Chapter: Artist, Nicola Ellis will be inviting visitors to take part in the creation of a new installation piece in the Arcadecardiff tent as part of this year’s Artcarbootique event at Chapter. For further information please visit: artcarbootique.com. SATURDAY 30 MAY, 10AM – 12PM: One-to-one mentoring and advice sessions for Cardiff-based early-career visual artists with Mark Devereux and Nicola Ellis. Sessions could include advice on promotion, applying for exhibitions, writing about your work, self-sustainability as an artist and portfolio reviews. FREE but booking essential via Eventbrite. SATURDAY 30 MAY, 2 – 4PM: Open in-conversation event led by artist Nicola Ellis and curator Mark Devereux based around More room for error. FREE no booking necessary.